Nintendo 3DS eShop title SteamWorld Dig has certainly been a success for Swedish developer Image & Form. Released in early August, it shot right to the top in the European and Australian eShop, while it has been riding high in the North American store as well. Its success is even more impressive when you look at the marketing campaign behind it. In essence, the developer relied largely on word of mouth, with gamers feverishly discussing the game on social media and posting let's play videos on YouTube. It was frustrating that we never really had very much time to create PR stuff such as gameplay trailers, exquisite screenshots, mockups and what have you. We're a pretty small studio, and everyone had their nose buried in development. 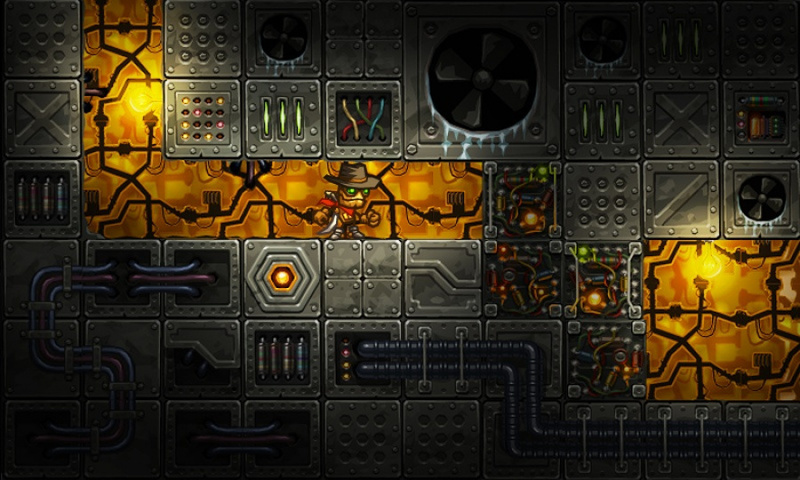 Sigurgeirsson said he was dismayed at the fact little promotional work was done upon completion of SteamWorld Dig, but once the very first trailer was released the day before its launch on the European and Australian eShop people started to take notice of this fun looking mining title, set in what looked to be a robotic steampunk environment. It featured on Nintendo Direct and great reviews started rolling in - including an 8/10 from ourselves - making it even more noticeable. People continued to talk about it on social media, with Twitter in particular, and all of a sudden this download game nobody had every heard of became a worldwide hit. One factor Sigurgeirsson attributed to the success in the eShop is the platform itself. SteamWorld Dig is also available on iOS but with the large amount of competition it can become "close to impossible to be heard", while the featuring process is "somewhat of a lottery". The eShop is a mature marketplace, with good opportunities to showcase your games and set the price points dynamically. Also, you can show a video clip directly in the store, which you can't on the App Store - a great feature. It gives the audience a better chance to understand a game before buying it. Indeed, Image & Form told us SteamWorld Dig was developed with the 3DS in mind as the D-pad was crucial to the game's mechanics. The developer is now highly regarded and it's likely its next project, whatever it may be, will be met with high levels of anticipation. What are your thoughts on SteamWorld Dig? Do you think it deserves to have been so successful? Let us know your thoughts on it in the comment section below. I think it has a lot to do with Minecraft. Minecraft blew up, and games like Terraria and this blew up because of similarities to Minecraft. Anything to do with Minecraft and you already have the money of consumers age 8 to 18. Finished it today, such a great game, they deserve all the success they get. This game is fantastic, and, except for a digging mechanic, has nothing in common with Minecraft. I picked it up at the end of last week and have had a hard time putting it down. Its a creative and fun game, it deserves success. On my third play of this one, really good fun and the success is well deserved! I'm actually buying this after I finish Dream Team! I'm really glad it's doing well without my money. I've really been enjoying it and am surprised it on only got an 8/10. I've never played minecraft, so can't comment there, but I'm a fan of Metroid, and the similarities are only positive . Yup, I thoroughly enjoyed the game as well, my only gripe was the lack of bosses.. that would have made the game an easy 9 for me. Well its an awesome game and I just had to post everywhere about. This title deserves all the praise its getting. I just hope they don't get ahead of themselves and rush their next title. But I doubt that will happen. I love this game but I couldn't imagine playing it on iOS. The controls are so tight with the d-pad and buttons, though the thought of using virtual controls on iphone/ipad is not good! I'll have to download this game sometime....love the art style. I was amazed at how much fun this game was. As soon as I started playing it, I didn't put it down for about 4 hours. The next time I started it I played until I finished it, and then started back up again. Excellent work. One the best eShop games this year. @GuSilverFlame same here. I was about to buy earlier this month but I found a new copy of tales of the abyss for the 3ds and I could not let it pass. Steamworld Dig is a masterpiece! Hopefully Image & Form will continue with this series as they're on a really good track record so far. Be nice if they did a prequel to Steamworld Dig to see what happened before. So far, this developer is one to look out for. So the top 3 eShop games so far this year is Steamworld Dig, HarmoKnight, and Gunman Clive? Just to contribute to what everyone else has already said, yes! It is a fantastic game! This game did not disappoint, though I just accidentally beat the game today (didn't know that room would be the final boss) and I can't believe it's over already. A very fun game. Very well executed, and simple to get into. No it is not like minecraft in my opinion. Many congrats to Image & Form for their success! Pretty much. Liberation Maiden's my favorite eShop title, with this in second. I hope Nintendo makes another HarmoKnight, would love for it to become a major series. I still haven't picked it up but only because I have a backlog of things to play on 3DS. Soon though! I'm pretty interested in trying this game out for myself once I finish playing some of the other games in my to-do list. It looks pretty fun to me. The e-shop trailer was great! Maybe I should try it?